VOCALOID2 - Rin x Len - Append Ver. In my gallery you find KagePro & VOCALOID fan art^^ Sometime I upload OC's and requests or art trades too! The scrapbook is for random pages of my sketchbook. Comments & Critique are welcome...! It's Miku again and the drawing took way too long! That final Kagerou Daze novel... was harsh. Comments & Critique are welcome of course... Feel free to ask something...! Damn, I missed it! So, belated happy birthday! Hoping you had a great day! Your artwork is AMAZING !! You have wonderful artwork pieces in your gallery! Keep up the awesome hard work you do! Your work has a particular varnish to it that can is really beautiful in it's own way! Good luck to you! 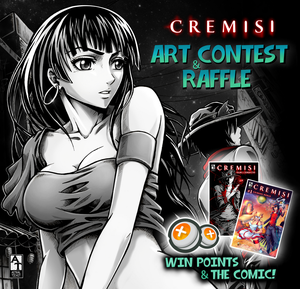 Welcome to the CREMISI Art CONTEST and RAFFLE! CREMISI Issue 2: Escape into Free Space is now available on Comixology! We use black, white, and crimson coloring ("BWC") to create a unique visual experience. Its a great occasion for me to make a big Cremisi event for you all! Thank you for your time and have the nice day!